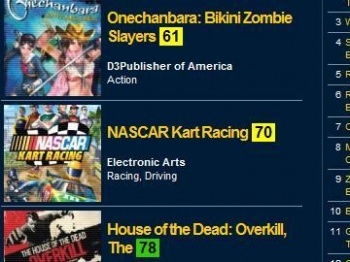 It's great when your game gets a swarm of high marks from reviewers, but don't expect score alone to sell it for you. Marc Doyle, the games editor for review aggregator Metacritic, says that the influence of Metacritic scores - and reviews in general - on videogame sales has been overstated, and that it's simplistic to say that a high score equals high sales. Doyle said that it was impossible to isolate the effect that Metacritic had on sales, and that while there was often a correlation between a high score and high sales, it didn't automatically mean that one led to the other. There were simply too many factors in play to pick Metacritic out as the deciding factor for a game's success, he said, and that a mediocre game with an established brand and a decent marketing campaign could succeed, while a strong game with little promotion would simply fall off the radar. As Doyle suggests, marketing plays a significant role in a game's success. Analyst Jesse Divnich said last year that marketing was three times more important than critical acclaim, and that the idea that reviews were the most crucial thing to getting good sales was a myth. Even ignoring the persuasive quality a marketing campaign might have, simply informing consumers that a game exists is going to make a big difference to sales, as people don't buy things they don't know are available.